Random And Some: "Love, lie and be handsome for tomorrow we die"
Woof. I finally finished Ulysses by James Joyce. I had been reading it off and on since September and finally decided to plow through it before January 1 since I had no desire to have Joyce's 265,000-word monkey on my back still in 2014. The Irishman, considered the greatest writer of the 20th century, let loose Ulysses on the world in 1920, right in between A Portrait of the Artist as a Young Man (1916) and Finnegans Wake (1937). I first came across Joyce's name in Gus Van Sant's 2000 drama Finding Forrester, one of my all-time favorites, and I had wanted to check out one of his books for years. Via 18 episodes and some highly experimental writing, Joyce chronicles one day in the life of Leopold Bloom, a Jewish man, and Stephen Dedalus, an intellectual. Their stories soon become intertwined. In the final chapter, Bloom's adulterous wife Molly shares her point of view. 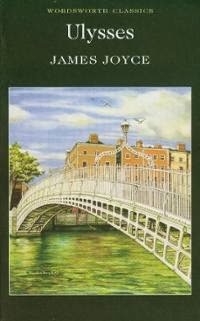 The power of Ulysses lies in its immense depth and loftiness. Since Joyce deliberately filtered no thought or emotion, Ulysses came out as an overwhelming stream-of-consciousnness, completely overpowering any hint of a storyline. Experimentation and literary ambition reign supreme. Ulysses is so complex and labyrinthine that I found no joy in reading it. Stylistically, I recognize that the book might be a masterpiece, with many brilliant meanings, but to an average reader like me it is a meandering mess that never reaches its destination. So much so that Joyce's vivid language loses much of its power. For shame. Still, every writer gets a second chance with me, so I will definitely check out Finnegans Wake, but first I need some time to process this atrocity and get my foots back under me. Letdown of the year!